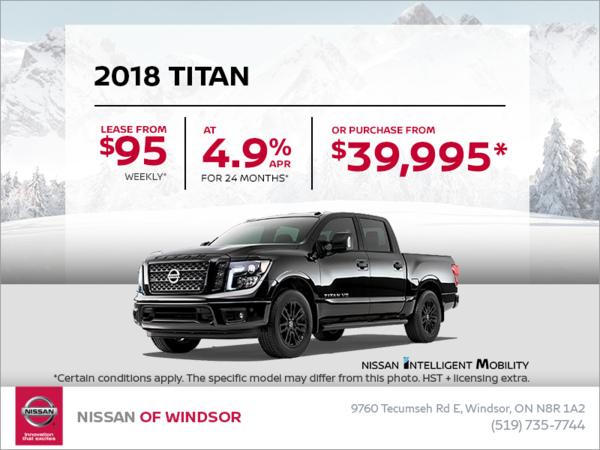 Lease the 2018 Nissan Titan starting from $95 weekly for 24 months with $3,795 down on select models. 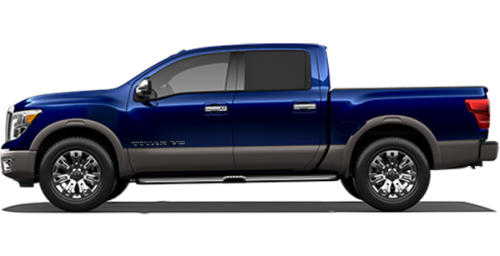 Or get the Titan CC SV for the cash purchase price of $39,995. **$39,995 selling price for a new 2018 TITAN Crew Cab SV base . All Pricing includes Freight and PDE charges ($1,795) air-conditioning levy ($100), applicable fees, tire tax, manufacturer’s rebate and dealer participation where applicable.License, registration, insurance and applicable taxes are extra. Offers are available on approved credit through Nissan Canada Finance for a limited time, may change without notice and cannot be combined with any other offers except stackable trading dollars.Retailers are free to set individual prices. Freight and PDE charges $1,795 air-conditioning levy ($100), applicable fees, manufacturer’s rebate and dealer participation where applicable. License, registration, insurance and applicable taxes are extra. Vehicles and accessories are for illustration purposes only. See your participating Nissan retailer for complete details. Certain conditions apply. ©2019 Nissan Canada Inc.